Orpheum #3 Model Mandolin Banjo, made by Rettberg and Lange, c. 1914, made in New York City, serial # 6858, shaded maple finish, laminated maple neck and rim, ebonized fingerboard, original black hard shell case. 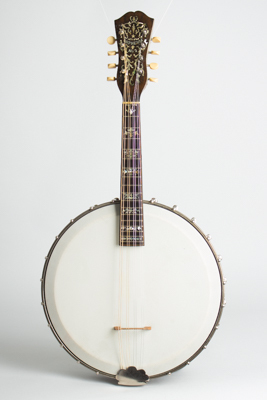 This is a very deluxe early banjo-mandolin -- an Orpheum Style #3. While Rettberg & Lange New York-made "man-jos" are not uncommon, this is the fanciest grade standard model of their flagship brand and has rather striking ornamentation. The maple neck and rim are finished in a dark rosewood-like stain; lesser models were left natural. The neck has typically fancy Orpheum touches including lavish colored shaped abalone inlay to the neck and headstock, with multiple wood bindings and underlay. The rim has multiple wood underlay trim and a half-herringbone strip inlaid on the bottom, with the raised tone ring characteristic of the brand. The heel is carved with a pearl-inlaid ebony cap. This very finely made banjo-mandolin represents Orpheum's instrument craft at its finest. It uses an 11 3/8" pot, which is somewhat larger than many similar period instruments. Despite its slightly squat appearance, this instrument has a very powerful sound with plenty of volume but a slightly less shrill attack than many 8-string banjos. This is a great relic of the just pre-jazz age, perfect for a jug band or ragtime orchestra. One of the coolest and fanciest "man-jos" we have seen, and a piece of New York's musical history. Overall length is 24 1/4 in. (61.6 cm. ), 11 3/8 in. (28.9 cm.) diameter head, and 2 5/8 in. (6.7 cm.) in depth, measured at side of rim. Scale length is 14 in. (356 mm.). Width of nut is 1 1/8 in. (29 mm.). This banjo remains in very original condition; the only concession to modernity is a plastic head. There is some very light wear overall, but really this instrument looks very little played in 100+ years. The frets and plating have some minor wear, and it plays as well as the banjo-mandolin can generally be expected to! Includes a period HSC that is a bit oversize, but looks to have been with the banjo from the beginning. Excellent Condition.